In my late 60s, I can still easily (fingers crossed and deo volente) manage, alone, to launch and sail a 12-foot dinghy (an ancient Gull, £150 from a supermarket notice board eight years ago). I do this mostly in Chichester Harbour, where my father first threw me and my brand new Cadet (perhaps in 1957) into the water at Itchenor, and where he later threw me and my not-so-new National 12 (perhaps in 1961) into the water at Bosham. I have been wondering what I might do as I get even creakier. By the way, the bottom line is that at a certain point, enfeeblement would start to demand teamwork. Indeed, embrace that idea, and all sorts of boating are possible. For now, and sticking with the ideal of being a sailor who can operate alone, I could just put on a dry suit and sail a Topper. I could go upscale a bit, and get into a Pico and various other slightly larger things of that type (the Laser Bug, the Topper Topaz, the RS Tera). These options tend in various ways to be uncomfortable. They are more like outings in a gym than the picnic cruising I fancy. I am much more Arthur Ransome, Snow Goose, Swiss Family Robinson, and decidedly Heath Robinson, than I am – oh well, you know – "hiking" and trapeze, and above all, I am not a racer. 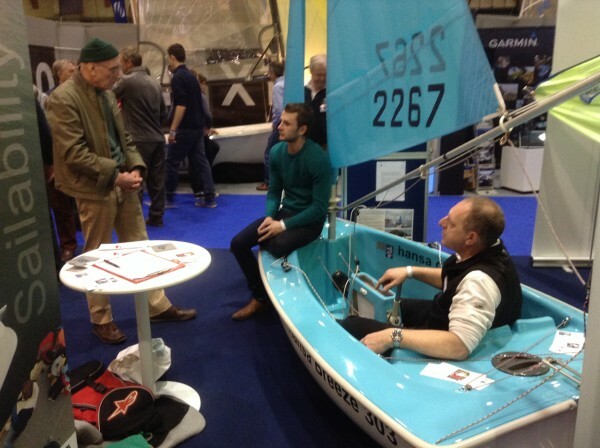 At the RYA/Suzuki Dinghy Shows in Alexandra Park, I have found three solutions to my old-man lone day-sailing. (The last, an inflatable catamaran, is quite different in type to the others.) I haven’t sailed any of these boats, nor previously dealt with any of the pleasant people who were displaying them. The fairly fit boating Bay Boomer…. (2) A comfortable gunwale to sit on to "lean-out" (a bit) in a big wind. (3) A transom, so the boat’s basically dry. (4) Ease of righting and draining after a capsize. (5) Self-bailing. This isn’t crucial, and having (4) will usually lessen the need for it. 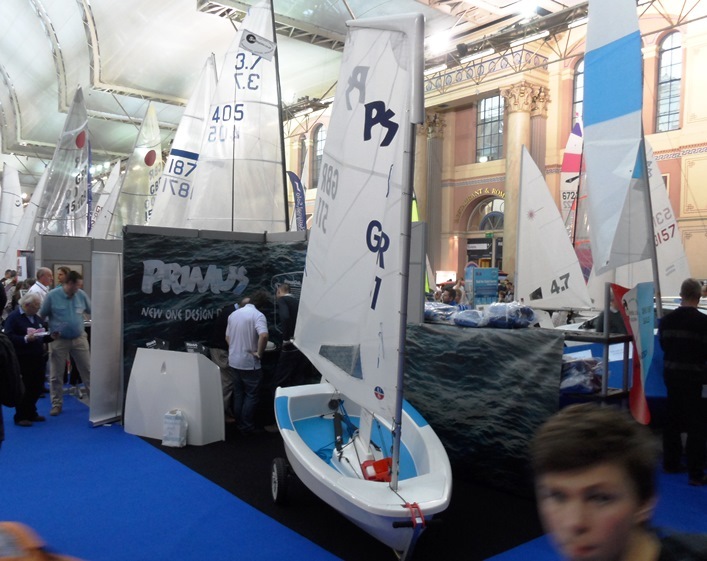 The 8-foot Primus Boat, designed in Hungary and with luck about to be manufactured in the UK, seems to me to do all the above. One might say it is a clever and grown-up version of the Optimist, and is indeed designed to be fitted-out entirely in Optimist gear. This is the Optimist-style dinghy which looks great for older adults seeking a light, proper sailing craft. I suspect this person doesn’t want to haul a boat about and doesn’t want to "lean-out" or capsize. In other words, this sailor will want to sit comfortably inside the boat, and it will need a yacht-like stability. I am not at all sure how these characteristics can come in a light boat. So I very much like the idea of the Hansa family of dinghies. These disability-friendly boats come in various sizes and degrees of raciness. Hansa 303 twin-masted sailing dinghy which can be managed from the in-board comfortable seat in the stern. It may be that the weight of the centre plate makes the Hansa 2.3 problematic for lone or enfeebled sailors, and especially those who launch from beaches. But I don’t think these boats need to be considered only as suitable for specialist clubs. Many sailing clubs could easily provide the team-work needed to launch and recover such a boat for older members. Granted even an untrained club environment, people could opt for higher specification Hansa boats, and some of them look fabulous. Options include glamorous paint-jobs. Details on Hansa boats www.hansasailing.com and from the UK dealer Steve Sawford Marine Ltd. I love the idea of this boat for sunny holidays at home or abroad. It appeals to the bit of me which enjoys borrowing my son’s Sevylor Pointer K1 blow-up kayak when it would be inconvenient to stow or use my Perception Comfort kayak. But I am pondering whether I would be comfortable for a few hours on it (maybe one could indeed sprawl easily, as on a beach, on its "deck"). And then there’s the price: £3000 plus, for a boat which might not see enough use. For this sort of money, I could have a Hobie Adventure trimaran kayak, with its comfortable seat. I wonder which you chose? I'm in exactly the same position now. A few months ago I 'hung up my wellies' by selling my small H.Rassy which I'd sailed to Greece from N Wales 15 years ago. Now Iv 'retired' to Cornwall & desperately need a liftable sailing dinghy to keep me sane! I'll look at at the websites you mentioned……..
Lynne – Another baby boomer who sails alone.